Christmas is less than a month away, and it is time to put up (or at least start thinking about putting up) your Christmas tree. One of the best parts of decorating for Christmas is choosing ornaments for your Christmas tree. There are so many options for DIY ornaments, but the best kind are the ones you can make as a whole family. 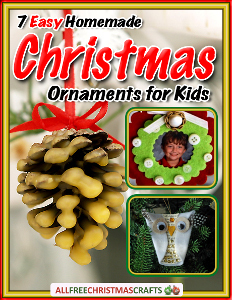 That is why we at AllFreeChristmasCrafts have put together a collection of great DIY ornaments kids can make in our eBook, 7 Easy Homemade Christmas Ornaments for Kids. From ornaments using craft fabric to nature-inspired ornament crafts to DIY ornaments made with materials from your own home, you are sure to find the right ornament crafts for your kids in this eBook. If you need a fun and festive way to keep your kids entertained over winter break, this free eBook is a must-have for the holiday season! 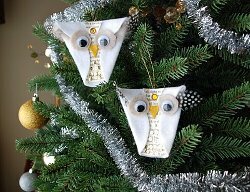 Create adorable DIY ornaments with your kids like these Snowy Owl Ornaments. Using large googly eyes, glue, felt, old book pages and other embellishments, make a cute owl to put on your tree this Christmas. Your kids will have a blast helping with these adorable animal ornaments and other fun projects made from craft fabric. Look to the outdoors for inspiration for you next Christmas craft project with your kids. For a fun and budget-friendly ornament craft, try these Wax Dipped Pine Cone Ornaments. 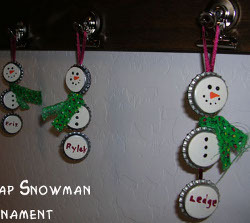 Inexpensive, yet adorable, these homemade ornaments are sure to be a favorite with the kids. Make these pine cone crafts and other nature-inspired projects with your kids this holiday season. 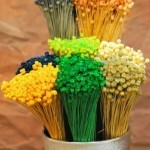 A recycled Christmas craft is the best way to save during the holiday season. Use old bottle caps to make this precious Bottle Cap Snowman Ornament. These ornaments can be personalized by name, so every kid will feel a sense of ownership over their DIY ornament creation. Make these homemade ornaments and more crafts featuring recycled items with projects featured in this eBook.